A woman I have never met is dead. Heather Heyer was a 32 year old paralegal and she was killed by a speeding car driven into a crowd by a nazi in Charlottesville Virginia yesterday August 12th. The car struck a portion of the crowd that was mostly members of the Industrial Workers of the World (IWW), a union for which I was once an organizer and delegate. It is now clear from reports received that she was a member of the IWW. Her membership in the IWW has been confirmed by union officials at the time of this writing and they are outraged at the events as their slogan is “An injury to one is an injury to all.” It does not matter if her dues were current. A close friend of mine, who was definitely a protestor, was hospitalized by the same nazi. I will not release that person's name because their activities have already caused nazis to target their family for threats and harassment. In the wake of this attack, before the president dropped his putter to get on twitter and mutter, the ACLU of Virginia held a phone in their own tiny hands to blame the protestors for being dead. The ACLU tweeted “A witness said a counter protestor threw a rock at a grey mustang. Car turned back and hit people on the sidewalk.” at 1:58 pm. This was after video that contradicted this statement had already begun to go viral. 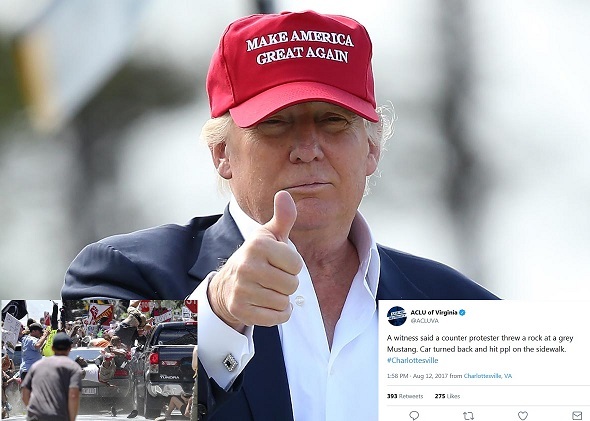 What actually happened was that James Alex Fields Jr, a neo-nazi from Maumee Ohio drove his Dodge Challenger into the crowd at over 40 mph and was only stopped when it impacted another vehicle that was halted at the corner for the protest march. 20 year old overgrown teenage nazi Fields then sped his broken sports car toy away in reverse. His airbags did not deploy on impact, suggesting that he had disabled them which in turn suggests premediation before departure from Ohio. He drove hundreds of miles to kill and the ACLU defended him. The Virginia ACLU had been very active in helping the various Nazi groups build their Unite the Right rally in Charlottesville. Knowing the rally was the beginning of a campaign under the slogan “First Stop Charlottesville, Last Stop Auschwitz” the ACLU sued to secure the permit for the rally that White Nationalists came armed to and openly called for violence at. It then wasted no time in attempting to provide political cover for the murder of a young woman and injury to at least 19 others including a friend of mine. The ACLU had ample opportunity to distance themselves from the attack on Saturday afternoon. Friday night, a group of mostly students, while having a rally under a banner that read “UVA Students Against White Supremacy” wear surrounded by an unpermitted march of over 400 nazis, maced and beaten without a single arrest being made. The ACLU of Virginia did not tweet in defense of the free speech rights of students on their own campus. The next rung up the ladder of liberal pearl clutching from the ACLU's style of active support for the rights of Nazis only is the rhetorical trick of false moral equivalency. In this context, many leading lights of liberal thought love to expose their actual lack of moral fiber, such as the time that Gandhi stated that European Jews had no right nor duty to flee or resist. “Hitler killed five million Jews. It is the greatest crime of our time. But the Jews should have offered themselves to the butcher’s knife.” Through the lens of all violence being the worst possible thing, regardless of context or power relations, the public mind's eye is lead to a kind of sick equality between genocidal maniacs and people who would rather take their chances on a battlefield than die in an oven. This month's lead editorial in the Atlantic bent history across to centuries to make essentially that same argument on this very issue. Attorney General Jeff Sessions, who has a history of attempting to prosecute civil rights workers and is actively working to use the full power of the DOJ Civil Rights Division to dismantle affirmative action offered a similarly weak response. Sessions promised to turn the FBI loose for a full investigation. In light of his subservience to Trump's line on every issue and the latter's use of many sides, history has shown that Sessions will use this murder to repress anti-fascist student demonstrators for violently attacking tiki torches with their heads. Neo-Confederates have long tenure in leadership positions within the Homeland Security apparatus and are unlikely to prosecute their comrades and blood relatives. The editorial section of almost every major publication is critical of the President today in hopes of pretending they had not said something similar in slightly more than 140 characters recently. The only people happy about the President's semi-coherent statement are the nazis themselves.